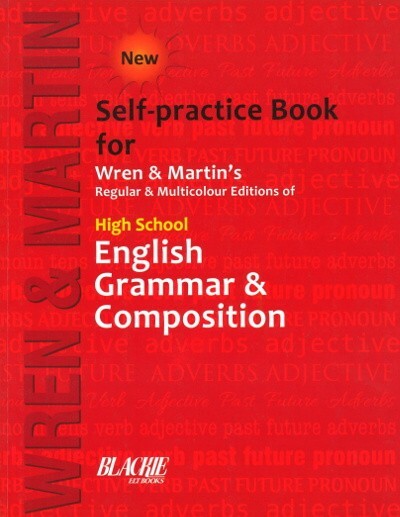 High School English Grammar & Composition by Wren & Martin’s (Self Practice Book) - The Self-Practice Book has been especially designed to cater to the demands of the users. Writing space has been provided to work out the answers in an organized manner. The self-practice book may be used with both the multicolour and regular editions. Wren and Martin’s High School English Grammar & Composition is one of the most popular and widely used reference books on English Grammar. It not only helps the students to use the language, but also gives detailed information about the language. High School English Grammar & Composition provides ample guidance and practice in sentence building, correct usage, comprehension, composition and other allied areas so as to equip the learners with the ability to communicate effectively in English. The Self-Practice Book has been especially designed to cater to the demands of the users. Writing space has been provided to work out the answers in an organized manner. The self-practice book may be used with both the multicolour and regular editions.